North Americans who visit Europe for the first time are hellbent on one thing: visiting a courtly castle. We’re obsessed with the ancient because we have none of it at home and since younglings we’ve been enthralled by fairy tale stories featuring pretty palace, handsome Prince and magical forest thanks to Disney’s master storytellers. For those looking to indulge in a vacation “Fit for a King,” look no further than Germany’s Saarland and Mosel, two regions which both offer quaint villages, royal riesling, crumbing castles and decadent delights. 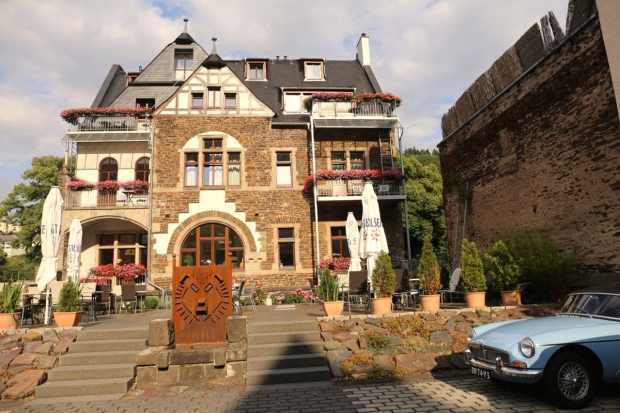 With its Mediterranean villa and enchanting Renaissance chateau, Victor’s Residenz-Hotel Schloss Berg lies peacefully tucked away among idyllic vineyards in the tri-border region between Germany (Saarland), Luxembourg and France. The origins of the castle go back to the 9th and 10th century. First built as a water-castle it served knights as accommodation and was only rebuilt into a Renaissance castle in 1580. 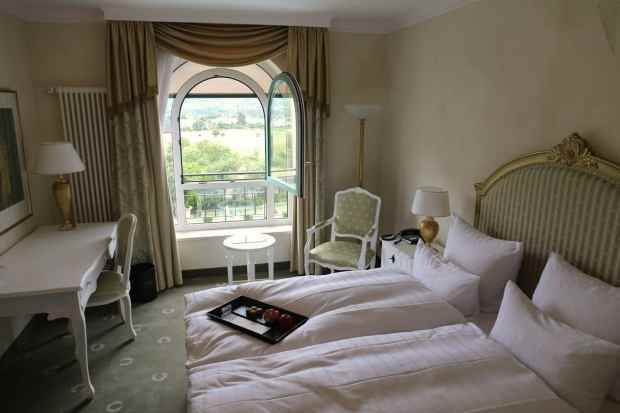 Today the property features posh suites, relaxing spa and award winning restaurant. From Dusseldorf the journey took five hours, an adventure which had me hopping on three trains which jolted through ancient forests and hugged the mighty Mosel River. It’s a perfect spot to start your holiday, tucked away from Germany’s main tourist attractions, the hotel’s remote location truly is a diamond in the ruff. The staff regularly welcome Europe’s creme de la creme, many of whom fly in for a visit and land at the properties helipad for a few hours stay. If you’re time crunched have your pilot fly you in at the dinner hour so you can sample through Chef Christian Bau’s 3 Michelin starred “Victor’s Gourmet-Restaurnat Schloss Berg,” recognized as one of the world’s most celebrated restaurants. Since 1748 Villeroy & Boch, has dazzled the world with its luxurious world renowned ceramics. Today visitors tour through a spectacular museum located in an old Benedictine Abbey in Mettlach overlooking the Saar River. The company has been a real trailblazer, inspiring a new table culture after the French Revolution (bowls, cups, plates) and sanitary culture after WWI (sinks, bathtubs, toilets). The founder Eugene Boch was an impressive figure, once close friends with Vincent van Gogh and producer of bespoke ceramics for five Popes and a long list of royals (Ludwig II of Bavaria, King Juan Carlos of Spain and the King of Saudi Arabia). It’s impossible to leave this place without the strong urge to outfit a mansion with fabulous fancies! Germany’s Saarland is best known for its lush Saar Hunsrueck National Park, which is made up of lush forests, rolling hills and raging river which offer ample opportunity for outdoor enthusiasts to paddle, hike and bike through one of Germany’s most stunning rural landscapes. The nature park covers an area of 2,055 square kilometres and is located where Germany borders France and Luxembourg. 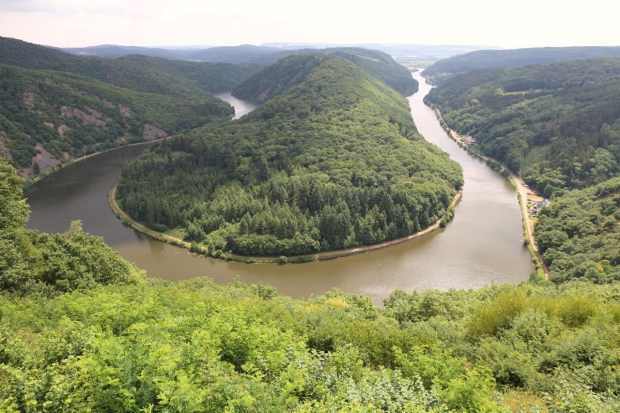 Saarland’s most popular attraction is the Saarschleife, a jaw dropping bend in the river which is best enjoyed as panorama after a 180 metre hike from the shore via popular Cloef lookout. Each new arrival plops down on a bench, huffing and puffing, guzzling water and gasping at the postcard perfect view. You’ve amazingly just conquered a mountain so why not rest and relax while overlooking your kingdom? Hop on a train and head north to the picturesque Medieval town of Cochem which sits perched overlooking the Mosel River, surrounded by Germany’s most celebrated riesling vineyards. During your stay sleep at Hotel Villa Vinum, a boutique hotel located in an old wine merchants mansion. A small fountain and fireplace in the hallway welcome guests while funky lounge, library and spacious patio out front offer a relaxed atmosphere. A huge oak staircase spins through the centre of the building, leading to twelve well appointed luxury guest rooms. Art and design fans will adore Villa Vinum’s take on “tradition meets modern,” as industrial chandelier, crystal adorned mirrors, pop art and contemporary furnishings find a happy home in one of Cochem’s most stunning heritage homes. When one arrives to the picturesque town of Cochem it’s hard not to feel as though you’ve stepped foot onto the set of a Disney movie. Snow White and Sleeping Beauty fairy tale vibes abound thanks to the jaw dropping location of Reichsburg Castle which sits on a cliff overlooking the Mosel River, surrounded by lush vineyards. Romanesque architectural fragments that were found in the castle well indicate an expansion of the castle after 1056 (with the central towering dating back to 1000AD). In 1689 the castle was totally destroyed by French soldiers under King Louis XIV of France. It remained a ruin for 200 years then was reconstructed by Louis Ravene, a rich merchant from Berlin. Today the castle maintains its medieval exterior while inside one discovers a magical and inhabitable nineteenth century chateau interior. Tours of the castle include a visit to the Weapons Room (fun fact: knights armour on display here in medieval times was worth 45 cows), Knights Hall where Mr Ravene would host and entertain his guests and the Hunters Room which is adorned with wild boar bust and massive beer steins. Located in the small town of Pomerania, Leo Fuchs Winery has been producing award winning vino on the steep, slate cliffs overlooking the Mosel since 1624. It is one of the oldest wineries in the Mosel, with a keen interest in providing room for tradition and modernity. The family own 11 hectares of land which focuses on growing 77% riesling, with a total output of 70,000 bottles a year. Leo Fuch’s has been celebrated time and time again as one of Germany’s top riesling producers. Pop by for a tasting at their Vinothek (wine shop) for a memorable sip on their sun-drenched patio. I sit here with winemaker Ulrich Fuchs and enjoy a tutored tasting featuring buttery chardonnay, a total of five rieslings (running the gamut of dry, medium and sweet) and toast a perfect afternoon with a bottle of riesling bubbly. On a hot summers afternoon there’s nothing I’d rather do than hop in a Mercedes convertible, roar up loose gravel backroads, swerve along vineyard adorned cliffs and plop myself down at a jaw dropping lookout for an impromptu picnic. My guide that day: a local winemaker from Hess-Becker Winery. She pops open one of her favourite bottles, splashes in my glass and offers a quick cheers before we nibble through creamy camembert, salty almonds and smoky charcuterie. We’re sitting amongst line-after-line of lush riesling vines while bee’s buzz about, in a frenzy to pollinate. We’re perched over the Mosel River and in the distance can see Beilstein Castle which appears to be beckoning us over for a visit. The cute medieval town is known as the “Sleeping Beauty of the Mosel,” because of its historic inaccessibility and beautiful setting. It’s castle is believed to date back to the 12th century, while today it welcomes visitors who come here to enjoy the stunning views while slurping back a sudsy pint. If you’re situated in Cochem on the Mosel it’s easy to hop on a ferry to explore smaller villages downstream. I enjoyed a quick 30 minute putter, past ancient castles, lush vineyards and pretty parks before arriving at the dual municipality of Bruttig-Fankel. The prosperity and pride of its citizens towards the end of the Middle Ages is reflected in the picturesque, twisting alleyways, old half-timbered houses with styled gables, the Renaissance architecture of the Schunk’schen Haus dating back to 1659 and the two old town halls and churches. The town has a deeply rooted winemaking history and I was of course thrilled to be here on the eve of their summer wine festival. A petite concert stage had been set up in the town square, wine merchants set up shop around the periphery and a food truck served up classic German street food classics. Smiling drunken locals danced with their arms in the air as the band performed traditional folk tunes. I enjoyed the small town ambiance while sipping sweet riesling and nibbling on salt flecked pretzel, crispy currywurst and fries topped with fried kidney gravy. Is there anything more decadent than eating cake for breakfast? Perhaps eating two slices in one sitting? The best spot in Cochem to wake up to the world is at Cafe Bistro Ambiente. The people watching on the patio here is top drawer. 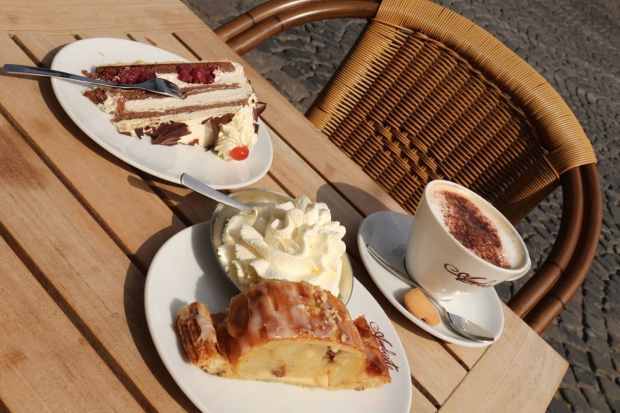 Sip on foamy cappuccino and nibble through two of Germany’s most beloved sweets: black forest cake and flaky apple strudel with whipped cream! Pamper yourself like a Prince moments before flying home via Frankfurt Airports VIP Services and Lounge. I was thrilled to discover that I was the first journalist given access to the airport’s VIP experience, typically used by heads of state, celebrities and jazzy jet-setters. I’m picked up at my hotel by a chauffeur and driven to the airport’s VIP red carpet entrance. I hand over my passport and sip an espresso in a chic lounge while my check-in is processed. We then pass through security (in less than 30 seconds) and hop in a BMW for a short 1 minute ride to the VIP lounge where I spend two hours relaxing before hopping on my flight home. Moments before my Lufthansa flight took off the tarmac an attendant arrived and escorted me downstairs to a slick Mercedes. We then zoomed below massive planes, parking directly under the wing of the aircraft which would be flying me home. The experience allows VIPs to totally avoid boarding queue’s. If you’ve ever wondered how celebs and big wigs experience flying without being detected by the public…this is it! For those looking to experience one of the world’s most exclusive airport lounges, Frankfurt’s VIP Services allow guests to rest and relax before their flight without ever having to step foot in the terminal building. Cost is 320€ if you’re in transit or 298€ one way.